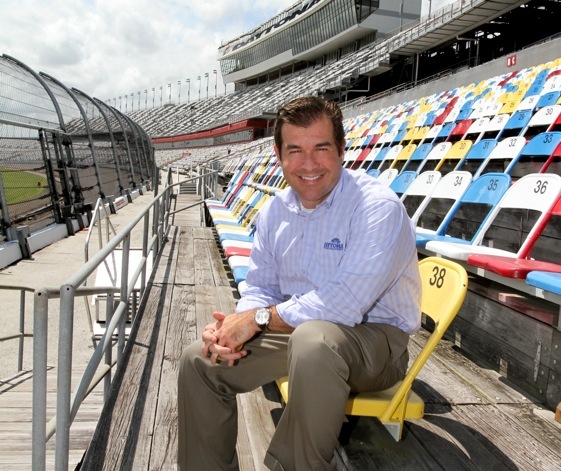 Joie Chitwood III has his first Speed Weeks under his belt as president of Daytona International Speedway, and all the events were crowd-wowing successes – as has come to be expected whenever a Chitwood and a racetrack come into contact. Joie’s grandfather founded the famous Joie Chiltwood Thrill Show, in addition to competing in seven Indy 500s and racing Sprint Cars. 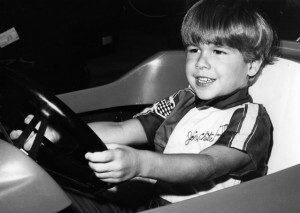 His son, Joie Jr., eventually took over the stunt-driving duties in the Thrill Show. Joie III also joined the show for awhile, then branched out into administration. The Chitwood show was good, clean fun. Sure, it was kinda hokey, but so what? The stunt-driving was exciting but not death-defying. You never worried that you’d end up a Chitwood shy a load after it was over. Joie Chitwood III has spent a lot of time around steering wheels. After the final race, while the track was being prepared for the show, my sports writing cohort Joe Caldwell wandered into the broadcast booth and – as usual – began to mischievously agitate. Caldwell asked Hamilton what time the “Joie Thrillwood Chit Show” started. The crowd roared with laugher, and through the glass patrician that separated the broadcast booth from the press box a steaming, red-faced Hamilton shook his fist at a hee-hawing Caldwell. The glass panel blocked out Ed’s words but we could read his lips. Those were the good days, the fun days, of racing, and the Chitwoods and similar entertainers played a major role in helping draw the crowds that supported the sport on the grass-roots level. Today the thrills may be over but the fond memories live on.